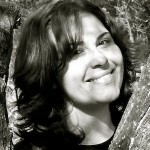 Welcome to the first day of our Q and A with Travel Writer Lara Dunston! 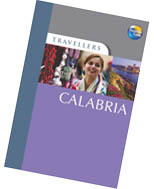 Remember that I’m giving away FIVE copies of Lara and Terry Carter‘s new guidebook, Travellers Calabria. See details here, but essentially you can comment every day this week for a chance to win Lara and Terry’s book. And don’t forget to go back and comment on yesterday’s post for a chance to win a Calabrian CD by the group Marasà. 1. OK, let’s start close to home. What was your favorite part about writing the Calabrian guidebook? The research trip around Calabria was fantastic. 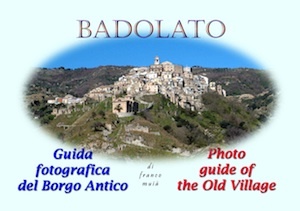 I write with my husband Terry Carter [pictured right, learning Italian after a bit of wine, always the best time to learn], who is a travel photographer and we did a month-long road trip around the region for this book and just loved it! Terry was shooting photos for the book, and when he’s doing photography for a book we tend to meet more people, because we’re not undercover as we might be if we were just writing. The research trip is the best part of any book commission for me. The actual writing can be monotonous although it can be wonderful in the sense that we re-visit the places in our imagination as we write about them, and re-live the trip in a way. But we’re tied to desks writing for 15-18 hours a day seven days a week for a month or two, which can get hard to handle – and for Terry, he’s also selecting photos and photo-editing. When we’re doing the research, we get to drive through spectacular landscapes (especially in the case of Calabria), explore charming towns (ditto! ), learn about the history, culture and society, and get to meet fascinating people along the way. Before we did the Calabria book, we’d spent a lot of time in Italy over the years, travelled all over, and had driven all over Sicily, but the furthest south we’d ever been on the mainland was the Amalfi. Calabria is very different to the rest of Italy and we just loved it. We thoroughly enjoyed the countryside, especially the tortuous drives through spectacular mountain scenery. We particularly enjoyed the food – the spices, the peperoncino, all the fresh seafood –we had some incredible gastronomic experiences that we didn’t expect to have. There was one particularly memorable meal near Camigliatello at La Tavernetta where we had a degustation menu that revolved around mushrooms that had just been picked. My god! I know a bit about food and have eaten in thousands of restaurants obviously, but I’d never tasted mushrooms this good before or realized they could be done in so many ways. 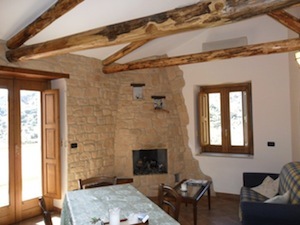 The company was pretty special that night too – we were taken to the restaurant by a Baron and Baroness – and our accommodation was equally memorable – their hunting lodge, Torre Camigliati, which is now a B&B. When we were in Amantea we stayed at the splendid Palazzo delle Clarisse [right] (more like a castle than a palace!) 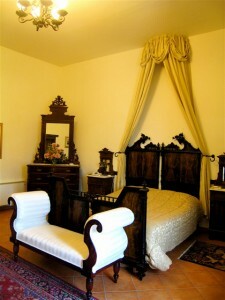 – in a suite that Queens had stayed in! – and we savored some of the most creative and refined cuisine we’ve had in Italy at their restaurant. That night we also dined with the owner, a fascinating and charming guy, a former Italian politician who now writes magical realist novels, and his friend, who produces some of Italy’s finest award-winning olive oil. We had another stupendous meal at Il Fiore del Cappero in Reggio Calabria – I think that was the same day I zipped around Reggio on the back of a Vespa doing inspections of B&Bs! Don’t ask… so sometimes the pleasure of research is as much about the people you meet along the way as it is the places you go to. 2. You’ve been all around the world, so please share: what is your favorite travel destination and why? There are so many wonderful places in this world that I find it impossible to pick one. I don’t have one favorite place. Nor does Terry. I guess if we did, we’d be living in one place instead of living out of our suitcases and travelling the world like gypsies! Rather, I have different destinations for different moods or seasons or activities… I love springtime anywhere in the Mediterranean or in the Middle East, winter anywhere in the Alps but particularly Northern Italy and Switzerland and Austria, while I also love winter in the outback in Australia (nothing compares to the clarity of light). Summer in San Sebastian, Spain, is pretty special, also Scandinavia, and anywhere in Italy – as crowded as it can get, there’s a real buzz about summer – especially in Calabria where everyone gets out in the evenings and does the passeggiata. And I’m happy in Thailand any time, ditto re: South America. Wow, what a fabulous start to the Q and A, Lara! Thanks! Be sure to leave your comment and tweet or post to Facebook to maximize your chances of winning a copy of Travellers Calabria! See contest details here. Its great to read about the process – always find the research the best stuff myself, on a training project, a blog post etc. Lara is spot on, often the writing itself is a tedious process, but it is a chance to revisit much of what has gone into the project. 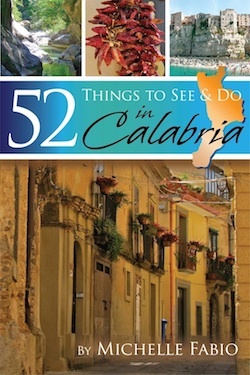 Still haven’t been to Calabria but sometime in the next two years its a must. I always love the research part of every writing project too…and yes, you must come to Calabria! .-= Willym´s last blog ..20th Century Blues – Part I =-. I would love to have a copy of the book so I can have a read and find some new places to explore…and see what she has to say about some of the places I have already visited! Also….it will come in quite handy for me since I am moving to Calabria in January! 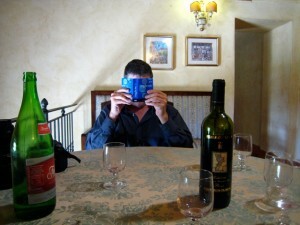 .-= Leanne in Italy´s last blog ..Stupid Tourist Comment of the Day. =-. Reading to her talking about Calabria and the book makes me want to be there all over again. .-= Ciaochowlinda´s last blog ..Fourth of July Salute =-. I’ve enjoyed this post. Her energy and love of Calabria jumps off the screen. Look forward to reading the book. .-= nyc/caribbean ragazza´s last blog ..Creepy fountain on Via Flaminia and some J.S. Bach =-. I’ve never been to Calabria although we know quite a few Calabrians here in Milan. This will come in handy when we do visit. I’m back again for today’s entry! Great Q&A! Lara is so generous w/ her information, unlike many writers who would probably stress “you’ve just got to buy the book”! There is a Calabrese restaurant in Ascoli Piceno that we cannot get enough of… everything spiced with a large dose of peperoncino (even the grappa… mmm). I cannot wait to get down to Calabria and have that type of experience over and over again! So nice to see an entire book being dedicated to Calabria instead of just the usual twelve measly pages! Hooray! Can’t wait to read it, and then explore that area more. I *heart* southern Italy! It sounds like Lara and Terry have a perfect life. Wow. And my appetite keeps increasing for a trip to Calabria. .-= jen of a2eatwrite´s last blog ..A Question for You =-. This sounds like a great book. Can’t wait to read more about my ancestral home area. What a fun and fantastic job to have too. Would love to do that kind of work. I want her life. Sooner, rather than later, and not all of it, but a good chunk of it. Maybe just the traveling all over the world part of it. It is fantastic that she’s doing that! YAY! I hear you; I would love to do that for a few years…perhaps we can do it together someday? Whee! Thanks for reading – unfortunately ours is not the perfect life as you’ll find out throughout this week. It certainly has its rewards, but the hours are long and freelancing is tough, but you’re right, the travel is the best bit – so enriching. Muchas gracias (as I’m in Spain at the moment!) for this opportunity, Michelle. 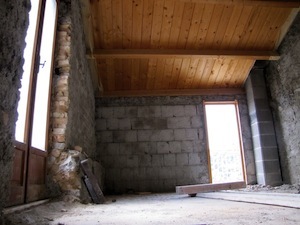 .-= lara dunston´s last blog ..Postcard from Mallorca: the alluring interior =-. I can get lost in these guide books for days reading, underlining, making notes in margins of all the places I want to visit and questions I will have! I can dream for months planning an excursion! I love guidebooks too, Bonnie…armchair traveling at its finest! Wow, a whole meal consisting of delicious mushroom dishes, sound heavenly. I too like to relive my trip through the pictures taken. .-= Ice Tea For Me´s last blog ..italia – i made it =-. i find it hard to pick my favorite places, too. each one is so special in its own way! what an amazing life you’ve created, though, lara. brava! 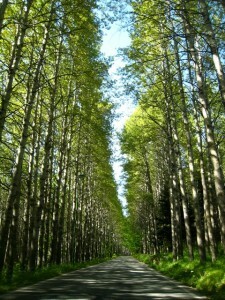 .-= jessiev´s last blog ..June Books Checked Out at A Traveler’s Library =-.